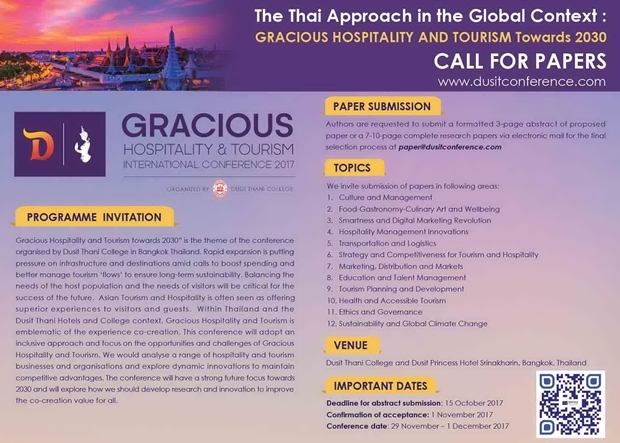 Dusit Thani College will organise 'Gracious Hospitality & Tourism International Conference 2017', a major conference event in Bangkok, between 29 November to 1 December, which will focus on sharing of academic insights and researches, as well as practical experiences, by world-renowned speakers from both public and private sectors, who will work out solutions to upgrade the tourism and hospitality industry, including raising the bar for 'Gracious Thai Hospitality' in the modern 4.0 era. The conference will be attended by people with diverse viewpoints from around the world, including entrepreneurs, coordinators, tourists, academics and individuals seeking to pursue self-development. The organiser believes that it will raise the bar for Hospitality 4.0 in the modern/international context, where communications and social networking play a big role in influencing the evaluation and decision-making by entrepreneurs and customers. The speakers of the conference, including, for example, Mrs. Suphajee Suthumpun, Group Chief Executive Officer Dusit International, Mr. Paolo Cuccia President of Gambero Rosso from Italy, Mr. Yoshiki Tsuji President of Tsuji Culinary Institute from Japan, Dr. Mario Hardy, CEO of PATA, Professor Dimitrios Buhalis, Head of Department Tourism and Hospitality of Bournemouth University, England and Mr. Yuthasak Supasorn, and high level representative Thai government agencies such from Minister of Tourism and Sports and Tourism Authority of Thailand(TAT) will help us find the solutions, which will lead to upgrading of the hospitality, hotel and tourism industry to respond to the gradually changing environment in a harmonious, balanced and sustainable manner. Interested participants can learn more details about, and register for, the above event, which will be held between 29 November and 1 December. They can also submit research papers on innovation, marketing strategies, competitiveness, etc, at www.dusitconference.com. The submission deadline is 15 October.